Adamant. The word traces back to the Latin adamantem derived from adamās, for 'hard as steel'. It's related to the Greek ἀδάμα/adámas for 'invincible' as well. In today's lingo, it means firm, unyielding, determined. Hence adamantine or adamantium also describes a mythical stone of extreme hardness to sometimes be applied to diamonds. And of course in Marvel's universe, Wolverine's claws and skeleton are bonded to a fictional metal alloy called adamantium. 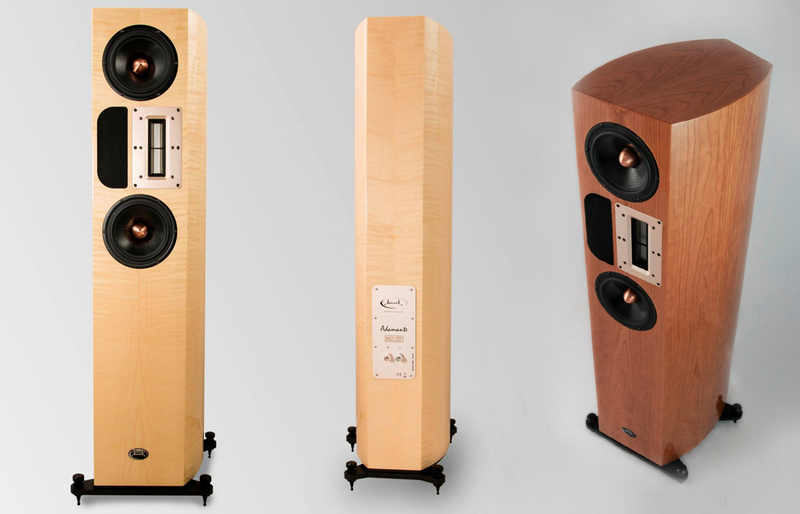 Now why do you reckon that the French at Apertura Audio have named their latest speaker model Adamante*? I could think of a few reasons. As 'unbreakable', it might point at chief designer Christian Yvon's determination to further perfect the particular elliptical crossover which he invented decades ago. Prof. Cauer published complex mathematical formulae describing similar networks. Hence they're often referred to as Cauer filters. Us techno-peasant civilians probably do best to imagine their complicated workings as a compound function of 1st + 2nd + 4th-order slopes stacked one atop the other. This nets more than 40dB/octave attenuation steepness. In the Adamante, the hinge of the separate hi/low-pass filters is set at 1.8kHz. This amounts to 37 crossover parts per speaker wired to high-power PCBs with 210µm copper traces. Contrary to popular expectation for such a complex network, this DRIM filter "allows for minimum intermodulation and respect of time alignment". * "About the name Adamante, I am fully allergic to all product names which mix letters and numbers or use any superlatives. We need a little bit of poetry in this word! I often find inspiration for names in literature; and it must sound like Latin, the origin of our language. Some people even think we're Italian. And I like the reference to Wolverine. He's the least politically correct of the X-Men, hence to me one of the friendlier ones." For a related naming reason I can think up, adamant becomes stubborn. This applies to the previously second-from-the-top Onira stubbornly clawing its way up closer to the Enigma range topper. With it the Adamante relegates the Onira to third down. Whilst looking similar, the 2nd-place usurper gets apparently very significant improvements to the 6.5" paralleled mid/woofers. Besides changes to their motors and damping for better linearity, those drivers now also flaunt copper phase plugs. The Adamante also gets the twice-sized 22cm²/88mg sandwich aluminium ribbon tweeter taken directly off the Enigma. So it's an upwardly mobile Onira with upgraded drivers and concomitant adjustments to the filter. The cabinet continues established Apertura construction. That means 28-44mm thick multi-laminated high-density molded MDF and bulging cheeks. Those curved side panels are of dissimilar width. That's because the vertical front baffle, itself significantly wider than the spine, attaches canted. Think of toe-in that's built in to see it in your mind's eye. It creates an asymmetrical cross section without any parallel walls. Only the top and bottom remain parallel to each other. A scheme of eight cross braces fortifies this structure. Also invisible once installed are the central 'drain' cone in the middle of the four footers connected to the metal outriggers; the down-firing port with its large diameter connected to a hybrid line; and four different liner/damping materials mixed to cancel standing waves. The sum of these parts nets a claimed 32-30'000Hz bandwidth at ±3dB. Sensitivity is a useful 91dB/1w/1m, nominal impedance is 4Ω. Physically it amounts to 52kg and 22 x 35.3 x 115cm dimensions without the outriggers and footers. If you've read my prior Edena review, you already know that for his own brand—he previously contributed to Goldmund and other famous firms—Christian Yvon champions 2-ways exclusively. That makes the 3-driver Adamante a d'Appolito two-way. "We prefer two-way architectures compared to which three-ways are far more complicated and costly. 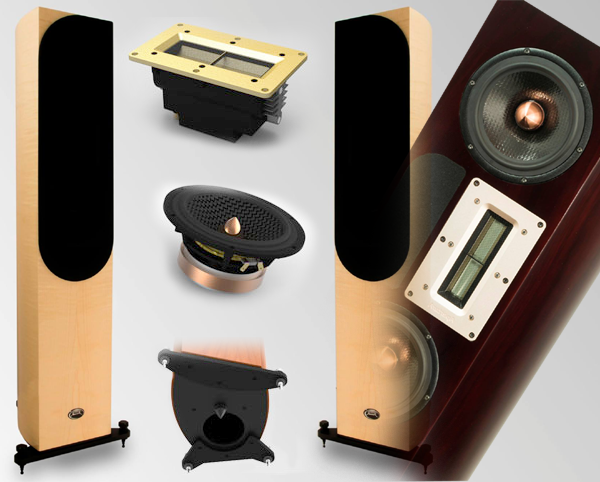 The qualitative gain of a 3-way speaker is almost always seriously reduced or zero compared to a properly designed 2-way and always to the detriment of far more complex filters. Here simplicity is better." Monkey coffins will wince whilst disciples of the less-is-more doctrine applaud. At €16'000/pr and on the slanted face of this, the Adamante plays it sparse on driver artillery. That's off-key to beliefs equating quality with lots of vertically stacked drivers, the bigga and mora the better. Clearly the core audience for this speaker thinks differently. Or else they'd walk right past. I had no such plans for Munich HighEnd 2015. There the Adamante would make its global debut with Lumin, Melco and Playback Designs for digital partners; Dr. Feickert for vinyl; and an Aesthetix stack of Rhea, Calypso and Atlas for the rest. It'd be my chance to presample the new speaker.